This species is accepted, and its native range is Tanzania to N. Botswana. Leaves mostly opposite; petiole 5–12 mm long; lamina coriaceous, dull green, 5–21 × 0.7–5 cm, linear-lanceolate to elliptic.lanceolate, acute to obtuse at apex, generally cuneate or attenuate at base, sometimes glandular-hairy at earliest stage of unfolding, with 4–6 pairs of lateral nerves, several lower ones strongly ascending Leaves mostly opposite; petiole 5–12 mm long; lamina coriaceous, dull green, 5–21 × 0.7–5 cm, linear-lanceolate to elliptic-lanceolate, acute to obtuse at apex, generally cuneate or attenuate at base, sometimes glandular-hairy at earliest stage of unfolding, with 4–6 pairs of lateral nerves, several lower ones strongly ascending. Umbels several per axil and at older nodes, 2–4-flowered; peduncle 1–5 mm long; pedicels in sockets, 0–2 mm long; bract 2–3 mm long, cupular, with small triangular limb Umbels several per axil and at older nodes, 2–4-flowered; peduncle 1–5 mm long; pedicels in sockets, 0–2 mm long; bract 2–3 mm long, cupular, with small triangular limb. Receptacle 1.5–2 mm long; calyx 2–4 mm long, cupular, truncate or erose, split by expanding corolla-base Receptacle 1.5–2 mm long. Corolla tube 3–4 cm long, pink outside, generally spotted white, redder along filament lines inside, head of bud greenish-white, darkening, lobes green to black inside; bud heads oblong-ellipsoid, rounded to truncate, 5-angular, slightly ribbed, lobe tips sometimes protruded as bosses or points up to 1 mm long; basal swelling 4–10 × 3–5 mm, ellipsoid-obovoid, tube constricted for 3–5 mm above; lobes 9–10 mm long, reflexed, the upper expanded part 4–5 × 1–1.5 mm Corolla tube 3–4 cm long, pink outside, generally spotted white, redder along filament lines inside, head of bud greenish-white, darkening, lobes green to black inside; bud heads oblong-ellipsoid, rounded to truncate, 5-angular, slightly ribbed, lobe tips sometimes protruded as bosses or points up to 1 mm long; basal swelling 4–10 × 3–5 mm, ellipsoid-obovoid, tube constricted for 3–5 mm above; lobes 9–10 mm long, reflexed, the upper expanded part 4–5 × 1–1.5 mm. Stamen filaments red; tooth 0.5–0.7 mm long; anthers 2.5–3 mm long Stamen filaments red; tooth 0.5–0.7 mm long; anthers 2.5–3 mm long. Berry red, 10–12 × 6–8 mm, oblong-ellipsoid, with persistent calyx. Berry red, 10–12 × 6–8 mm, oblong-ellipsoid, with persistent calyx. In miombo woodland; from near coast to 1800 m; almost always on Brachystegia or Julbernardia, flowering in most months, but mainly in dry season from March to October. There is also considerable variation in the colour of the flowers. The type was described as having blood-red flowers; generally, however, they are pink, but the prominence of white spots seems most noticeable in the central part of the range (T. guttatus). Fire-adapted forms have been recorded in southern Tanzania, with short erect shoots and brittle glaucous leaves, see Polhill & Wiens, loc. cit. (1999). 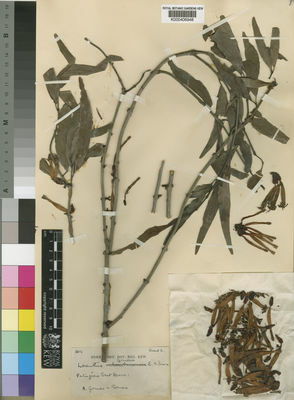 In its typical form T. dependens from Angola and westernmost Zambia has long pendent stems, with very narrow leaves and corolla buds bearing conspicuous points on the head, and comparable forms have been described from Mozambique as L. gomesii. In the middle part of the range the buds are normally naked or with very small bosses, and the leaves are more variable, but all transitions occur and speciation is probably still incipient. 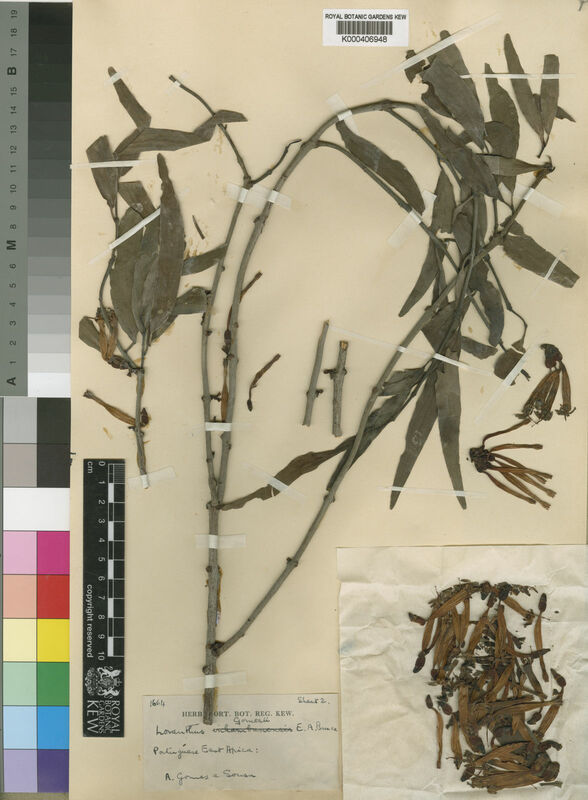 See also note under T. forbesii, particularly if collected on Uapaca. Stems spreading then pendent to 1–3 m, glabrous, iron-grey, densely lenticellate. Calyx 2–4 mm long, cupular, truncate or erose, split by expanding corolla-base. Style with neck 2.5–3 mm long; stigma 0.7–0.8 mm across, capitate. Stems spreading then pendent to 1–3 m. long, glabrous, iron-grey, densely lenticellate. Leaves mostly opposite; petiole 5–12 mm. long; lamina coriaceous, dull green, linear-lanceolate to elliptic-lanceolate, 5–21 cm. long, 0.7–5 cm. wide, acute to obtuse at the apex, generally cuneate or attenuate at the base, sometimes glandular-hairy at earliest stage of unfolding, with 4–6 pairs of lateral nerves, several lower ones strongly ascending. Umbels several per axil and at older nodes, 2–4-flowered; peduncle 1–5 mm. long; pedicels in sockets, 0–2 mm. long; bract cupular, with small triangular limb, 2–3 mm. long. Receptacle obconic, 1.5–2 mm. long. Calyx cupular, 2–4 mm. long, truncate or erose, split by expanding corolla-base. Corolla-tube 3–4 cm. long, pink to crimson outside, generally spotted white, redder along filament-lines inside, head of bud greenish white, darkening, lobes green to black inside; bud-heads oblong-ellipsoid, rounded to truncate, 5-angular, slightly ribbed, lobe-tips sometimes protruding as bosses or points up to 1 mm. long; basal swelling ellipsoid-obovoid, 4–10 mm. long, 3–5 mm. in diameter, the tube constricted for 3–5 mm. above; lobes 9–10 mm. long, reflexed, the upper expanded part 4–5 mm. long, 1–1.5 mm. wide. Stamens red; tooth 0.5–0.7 mm. long; anthers 2.5–3 mm. long. Style with a neck 2.5–3 mm. long; stigma capitate, 0.7–0.8 mm. across. Berry red, oblong-ellipsoid, with persistent calyx, 10–12 mm. long, 6–8 mm. in diameter. Brachystegia woodland, generally on Brachystegia or Julbernardia, but with local races developing in transition to mixed woodland (see note); 900–1600 m.
Loranthus pendulus Welw. ex Engl. F.T.E.A., Loranthaceae: 74, fig. 11/3–8 (1999). TAB. 35, fig. A.
Verh. K. Akad. Wet., sect. 2, 29, 6: 110 (1933). Polh. & Wiens, Mistletoes Afr. : 192, photo. 78, fig. 17C (1998). Danser in Verh. K. Akad. Wet., sect. 2, 29(6): 110 (1933).